I flashed beta bios 0.0.7.2 and I noticed new add "bank group swap alt" in the bios menu now. Did you seen it ? Any pointers ? Anything more than 1 core makes my system lag and stall out . incorrect overclocking of the processor? what settings? @1usmus and or to anyone that can help, thank you in advance. I used the calculator version 1.4.1 and I can boot using the 3600 speed SAFE calculation, however, I am always getting BSODs/system crashes randomly so I decided to back down. What I did is to use the FAST calculation 3000 Mhz because any higher than that when you choose to turn off the Geardown mode it won't work. So if I want higher than 3000 RAM speed I am stuck with SAFE calculation which suggests Geardown mode enabled. 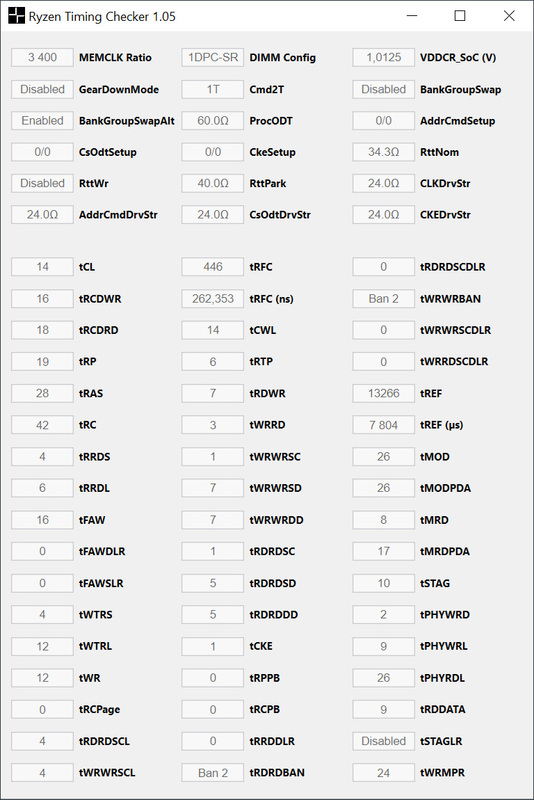 Now I am at 3000 Mhz as the FAST calculation from the calculator all default, Powerdown mode, Geardown mode and BankGroupSwap all disabled and so far stable no BSODs/crashes. When it comes to voltage, I just followed the recommended volatage for the VCORE SOC and DRAM Voltage. Hope you can give me guys any suggestions of what to do, I just don't have much knowledge of tinkering the RAM values or what to check/adjust to make it stable at 3600 Mhz. I am good if at least we can make it work stable 3200 Mhz FAST/tight timings or if it is still possible at 3600 using SAFE or FAST calculation just with no crashes/BSODs. If you want screenshots or any additional info you need that can help, I'll reply as soon as I can. Last edited by 1usmus; 03-10-2019 at 12:33 PM. 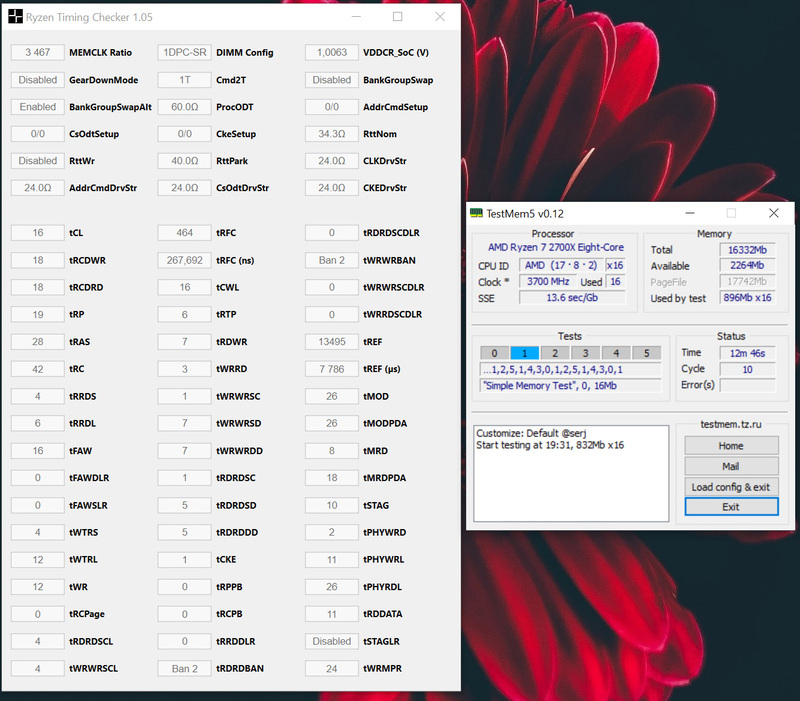 I'm stuck @ 3666 Mhz with F4-4400C19D-16GTZSW. Thanks. Last edited by BipBip; 03-12-2019 at 12:51 PM. Last edited by BipBip; 03-12-2019 at 08:50 PM. Has anyone tried values similar? Oh, no I've found the same. I would ask for your opinion on what is too low. I've found that tRDRDSCL/tWRWRSCL at 2 and tWRWRSD/tWRWRDD at 5 with tRDRDSD/tRDRDDD at 3 cause weird issues in CS:GO specifically. Player models will just suddenly appear when viewed at distance. So I usually run 3,3 and 6,6 and 4,4. What I tested earlier was just to test. If there are other timings I should be made aware of and kept above a specific value then I'd love to know so I don't go too low.